You can make that one training camp holdout for the Steelers as they began preparations for the 2017 regular season. While star running back Le’Veon Bell has yet to sign his $12.1 million franchise tag and hasn’t reported to training camp, several outlets–but most reliably their official website–are reporting the Steelers signed starting left tackle Alejandro Villanueva to a new four-year contract-extension as players reported to camp on Thursday. Villanueva, a decorated military veteran who served several tours in Afghanistan, played his college ball at Army, where he tried his hand at several positions–including left tackle, defensive end and tight end–before entering the NFL as an undrafted free-agent in 2014. He signed with the Eagles, who wanted him to play defensive end. 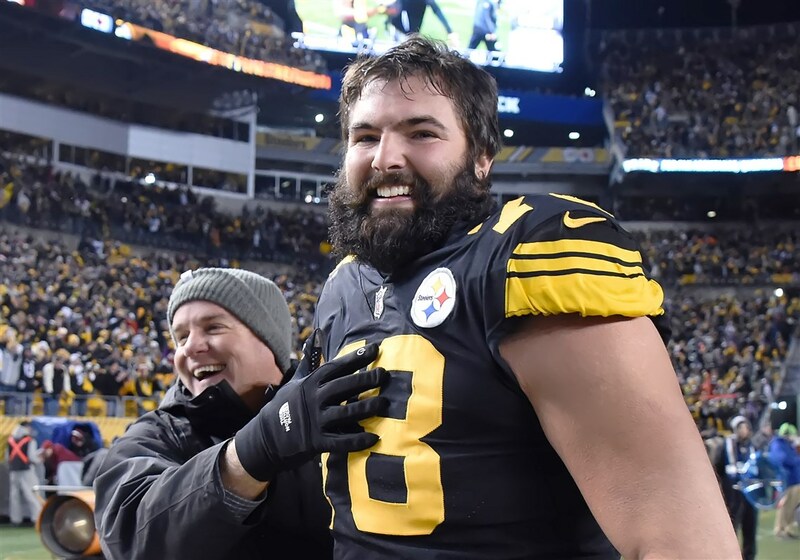 After failing to make Philadelphia’s active roster, Villanueva made his way to the Steelers practice squad in 2014, and that’s where he remained for the rest of the year, while he added weight to his 6’9″ frame and learned the left tackle position under legendary offensive line coach Mike Munchak. Villanueva made the Steelers active roster as a reserve offensive lineman in 2015 and got his big career break later in the year, when starting left tackle Kelvin Beachum suffered a season-ending ACL tear in a Week 6 victory over the Cardinals at Heinz Field. Villanueva started the final 10 games of the 2015 season and all 16 in 2016. As an exclusive-rights free-agent, Villanueva, 28, had no real leverage but to show up and play in 2017. But as training camp approached, there were rumors that Villanueva would hold out in pursuit of a new deal. However, with Thursday being the official date for players to report to St. Vincent in Latrobe, Pa., the new agreement for Villanueva means he will get to continue to improve on his craft. As per usual, the Steelers didn’t disclose any financial terms for Villanueva’s deal, but Jeremy Fowler of ESPN.com, citing an unnamed source, is reporting the contract is worth $24 million. This entry was posted in Steelers 2017 Preseason and tagged Alejandro Villanueva, Le'Veon Bell, Pittsburgh Steelers, Steelers free agents, Steelers offensive line. Bookmark the permalink.